Thomas Dunne Books, 9781250024312, 296pp. 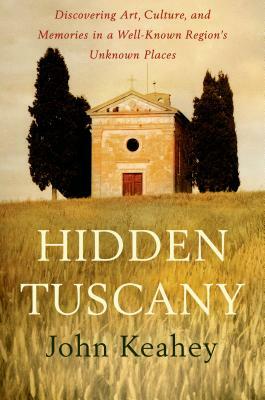 In Hidden Tuscany, acclaimed author John Keahey takes the reader into a part of Tuscany beyond the usual tourist destinations of Chianti, Florence, and Siena. The often overlooked western portion of Tuscany is rich with history, cuisine, and scenery begging to be explored, and Keahey encourages travelers to abandon itineraries and let the grooves in the road and the curves of the coast guide your journey instead. Follow Keahey as he turns off the autostrada and takes roads barely two lanes wide to discover fishing villages along the Tuscan sea. Then move inland into rolling foothills adorned with cherry orchards, ancient olive groves, and sweeping vineyards that produce wines that challenge Chianti's best. Here it is still possible to follow the paths of Romans, Crusaders, and pilgrims from throughout the western world who were eager to reach Rome. Hidden Tuscany provides intriguing images of places such as Livorno, a port city with canals; Pietrasanta, Tuscany's Citta d'Arte; and Capraia, an island formed by volcanoes. Keahey engages with the inhabitants of these enchanting landscapes, whether sculptors who toil in marble studios or residents whose own memories and traditions illuminate major moments in world history. From coastal towns to vineyards farther inland to the Tuscan archipelago, Keahey reminds us that each village, city, and island has its own unique story to tell. For armchair travelers and vacation seekers alike, Hidden Tuscany brings a new side of this classic Italian region to life, and the result is mesmerizing. John Keahey is a travel writer and former award-winning newsman. A native of Idaho and graduate of the University of Utah with degrees in history and marketing, he first stepped onto Italian soil in 1986. Enchanted by what he found--stunning ancient ruins, unique food, magnificent countryside, and, most important, warm and engaging people--he has returned nearly every year since. His other travel narratives include Seeking Sicily: A Cultural Journey Through Myth and Reality in the Heart of the Mediterranean, Venice Against the Sea: A City Besieged, and A Sweet and Glorious Land: Revisiting the Ionian Sea. Keahey lives in Salt Lake City, Utah, with his wife and partner Connie Disney, a freelance book designer.